1. I have a wife, a 6-year-old daughter and a 2-year-old son too. 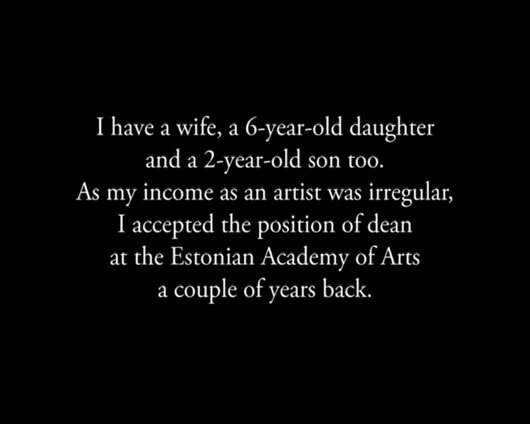 As my income as an artist was irregular, I accepted the position of dean at the Estonian Academy of Arts a couple of years back. 2. To get a bank loan and provide a flat for my family. 3. Now I have a 25-year bank loan and a nice little apartment in central Tallinn. 4. Working as a dean is interesting but draining and takes up practically all of my time. 5. There’s constantly less and less time to do art – a few hours in the morning before going to work and in the evening after 17.00, when I should actually go home and spend time with my children. 6. So I feel guilty the whole time I’m working in my studio. They’re waiting for me at home but I get there after they’ve gone to sleep. 7. And I go back to the studio in the morning before they get up. 8. And I cannot change any of this for the next 25 years because I have a bank loan. 9. I’ll no doubt spend the best years of my life like this instead of pursuing creative projects. 10. And this torments me. 12. It’s like I’m in some kind of vicious circle. I’m doing everything I can to be able to pursue my art, but doing what I must do takes so much energy, that I’m not able to create. 13. I recently had a small exhibition in Budapest and happened to get acquainted with a scientist. I told him about my problem. 14. The scientist told me he knows what I must do and that he knows someone in Tallinn who can help me. 15. When I got back home I called the number I’d received from the scientist. I was given an address and asked to bring my wife and children along. 16. It was some kind of physics lab. My wife and children were directed into a room containing nothing but a funny bench. 17. A kind of white, square bench and in the middle of its backrest was a little pull-down shelf. On the shelf were some worn-out looking toys like you usually find in the waiting rooms of clinics. And some funny looking straps hung from the bench. 18. I was directed into another room right beside the one with the bench and asked to wait. 19. After some time a man came in and told me that he knew what the problem was and that it could be solved by killing my wife and children. This shocked me completely. 20. When I had somewhat pulled myself together I went and peeked in the door to see what my wife and children were doing in the next room. They were sitting next to each other and playing. I watched them for some time with confused feelings and snuck back the way I’d come. 21. The man was still there, waiting. I’ll briefly sum up our conversation. 22. Me: Is there really no other way? The man: No. You are the one who wants this. It’s necessary. 23. Me: (after a pause) But… how then…? The man: With electricity. That bench is an electric chair. Or put them into the meat chopper. We’ll see. The man: Do not worry about that. You are going home now and we are taking care of this at night. You don’t need to think about it anymore. The man: Yes. It must. 26. I burst into tears. I was led out of the building through the back door and I went home. 27. That was the worst night of my life. 28. I can’t even tell why but the next morning I went back to the lab. 29. I carefully peeked into the room, where I left my wife and children the previous night. The room was empty. 30. They had already been taken away. 31. Only the same weird bench in the corner. 32. And the same worn-out looking toys on the pull-down shelf. And the straps. 33. 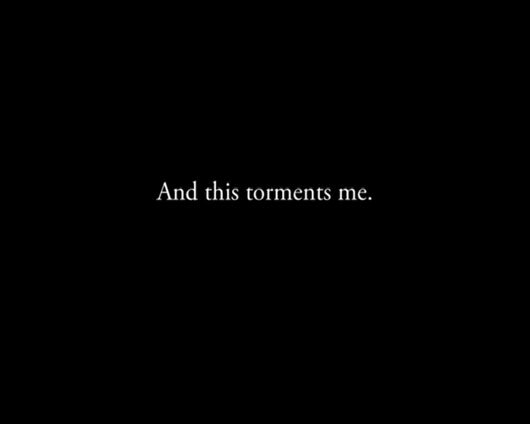 I was overcome with unbearable anguish.